On episode 228 of RNFM Radio, Kevin and Elizabeth chat it up with nurse author, Tonia Chisolm, RN, BSN.This is a highly inspirational and motivational episode; Tonia goes deep, shares her personal story, and lays it out when it comes to nurses valuing themselves enough to ask for what they deserve. 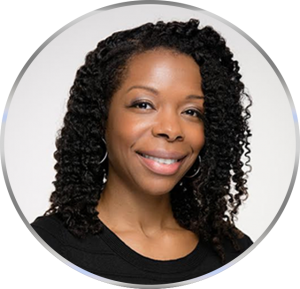 Tonia has been a registered nurse for over a decade; she specializes in cardiology, with extensive experience in various Cardiovascular Intensive Care Units. She has spent the majority of her career immersed in hospitals and the national healthcare system through travel nursing and advanced training. Currently based in Atlanta, Georgia, Tonia continues to work in nursing while empowering others in the field to embrace their life’s work in ways that spark personal fulfillment and financial freedom. This article on Becker’s Hospital Review was referenced during the episode. JAMA article about male-female nurse income disparity. 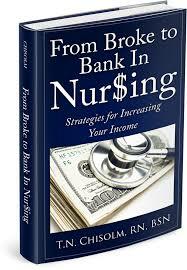 Tonia’s book, “From Broke To Bank In Nursing: Strategies For Increasing Your Income,” is an easy and inspiring read that will get you thinking about how to increase your income and improve your financial stability. Enjoy the conversation, and let us know about your successes and challenges when it comes to M-O-N-E-Y! 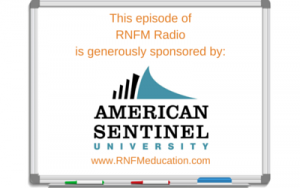 This episode of RNFM Radio is sponsored by the good folks at American Sentinel University. As a fully accredited online university, American Sentinel offers a variety of courses related to healthcare and nursing, including RN to BSN, and five MSN programs: Informatics, Case Management, Nursing Education, Nursing Management, and Infection Prevention and Control. They offer an RN to BSN/MSN, a program, as well as two tracks for those wishing to pursue a Doctorate of Nursing Practice. American Sentinel also offers a certificate in Prevention and Control that assists clinicians in acquiring the knowledge they need to develop best practices for infection prevention and control. Please visit RNFMEducation.com for more information. We want to thank each and every one of you for listening to the podcast.